Understanding Face-to-path is a key skill for playing golf. It is responsible for the amount of curve or shaft lean in your swing. I use a plane board to help illustrate how the face-to-path relationship changes throughout the swing and how you can visualize it. Seeing Club Plane on 2D Can you get a sense of your plane, or path, on 2D? Two Way Miss - Learn From The Curve If you have a two-way miss, you want to figure out which path problem you need to solve. Delofting vs Closing The Face What really happens when you "deloft" the club face. Dead Hands Release Discussion How do you know if the "dead hands" thought is right for you? Case Study - Squaring the Club Face to Fix A Scoop Slice Watch how working on a concept, like squaring the clubface, can change multiple swing checkpoints. Face Control With The Wedges Club face control is a key skill for golf. The way the face is controlled is different with the wedges than it is with the longer clubs. 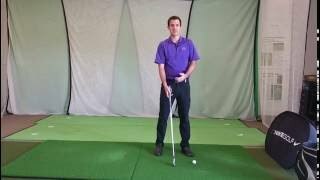 Fix The Club Face Closed Many golfers struggle with closing the clubface, this drill helps break through that barrier. Fixing Club Face Too Open In Transition Rotating the club-face open in transition is a symptom of a bigger issue - pulling with the arms instead of the body. Check Grip At Last Parallel - Club Face Checkpoint The ideal place for an advanced player to determine grip strength is when the shaft is parallel to the ground during the downswing.